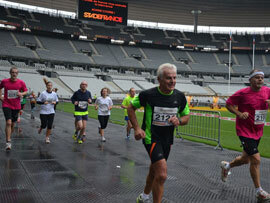 All the distances get across the Stade de France. 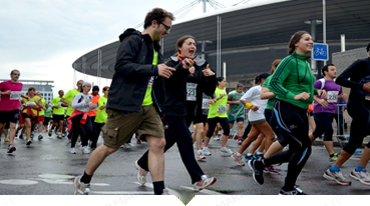 Whether you run the Half marathon the 10 km or participate in La Belle Vadrouille, you will all pass through by the interior of the Stade de France. 1st edition of la Voie Royale. 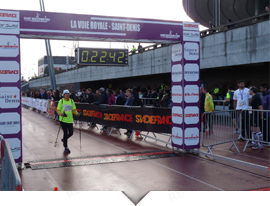 The Voie Royale keeps its way, but focuses on the distance of the international 10 km and the 5 km becomes a ballad open to all, called La Belle Vadrouille. This is not a competition, so there is neither ranking nor timing. 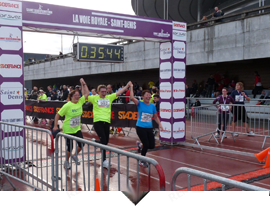 La Voie Royale returns in 2019 with its usual formula and the traditional International half-marathon and 10km. The program features two races and a leisure distance. Walking or running, it's up to you ! Running or walking, the Royal Way awaits you. Running or walking, it's up to you ! Run or walk, do not miss the opportunity to participate in this unique experience. La Belle Vadrouille allows you to discover the park of the Legion of Honor located in the historical center of the city of Saint-Denis, the Basilica and the Stade de France. To pick-up your start number, you will have to bring - your medical certificate of no contra-indication to the practice of running in competition. - YOUR ID CARD WITH PHOTO. If you want another person will pick-up your bib number for you, please provide him/her a power of attorney and your identification. For groups, it will be done by one of the members of the group (referent of the registration, or by one of the registered runners). The ID card is necessary. - Sunday, October 21st until 45 minutes before the start of your distance. The parking P3 of the Stade de France is available and free on Sunday April 30th. Entrance is via the Leroy Merlin store. Where to leave your bags? Trick : In case of high traffic on the road it is faster to make the path on foot. From the RER B, D or subway station. 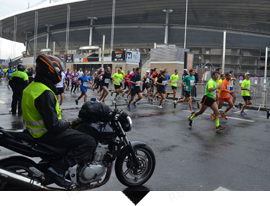 Race start will be Avenue Jules Rimet (In front of the entrance of Decathlon Saint-Denis Stade de France). Attention, it will takes 5 minutes between the place of withdrawal of bib number and the race start. 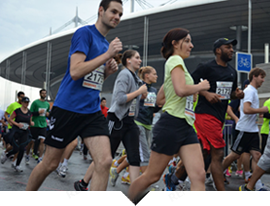 For participants of the 10 km you must send us a medical certificate, dated less than one year at the date of the race and obligatorily mentioning "no contra-indication to the practice of running in competition». See example. This medical certificate can be replaced by a FFA or FSGT 2018-2019 license (Residents in France only). La Belle Vadrouille is not a competition, medical certificate is not required. An urban and historical itinerary Discovering Saint Denis, the city of the kings of France. - Children under age of 14 must be accompanied by an adult. There will be no registration on the spot on October 27, the day of the event.